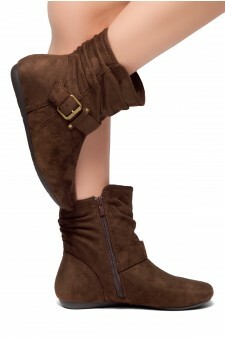 SHEARLLY Every fashionista needs a chic short pair of boots in their collection! 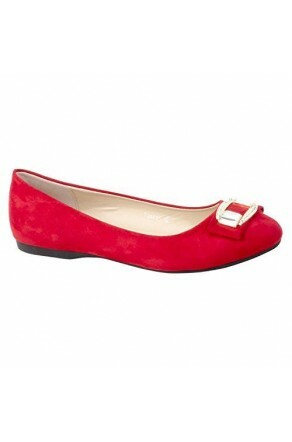 This pair features a faux Suede material, ankle length cut, thorough side zipper for closure . Pair these boots up with skinny jeans and a matching faux leather jacket to perfect your casual look. Shaft measures approximately 5" from arch. Fashion Women Buckle up booties. Measures 0.5 inch heel on a 0.15 inch platform. Available Size 5 - 11. Most comfortable faux suede booties! Feels like you\'re wearing sneakers or rubber. I can wear all day with no discomfort. Two thumbs up! I had two items designed at Shoeland - both were made in good time and are excellent in quality. I couldn\'t be happier for the Shoeland services. The website is so cool and always updated!